I used the Sept 08 sketch 2 for this challenge. These were taken in Scotland in the early 50\'s of my family before moving to Australia. Not the usual papers I would use for this type of LO but like the change. 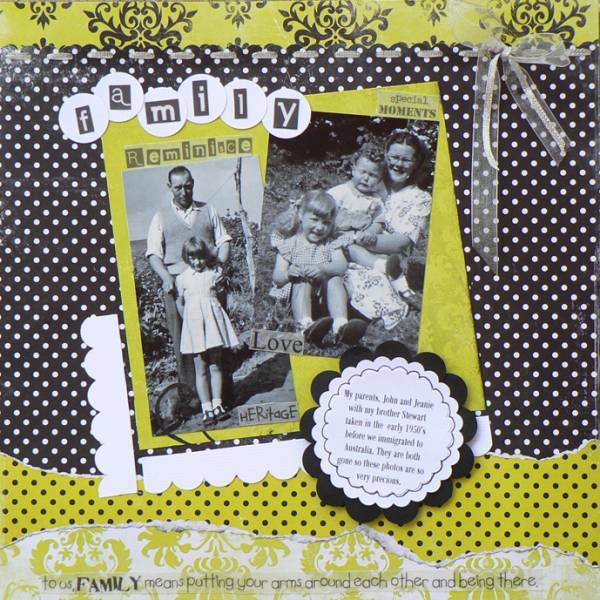 Love the ribbon through the holes of the punched border. Great choice of pps! Well done Cossie, I really love that pp and it goes so well with b & w photos. I love your use of the ribbon and the various scalloped elements work beautifully. Wow. What a stunning LO! The ribbon looks fantastic, and the PP's work so well with those beautiful photo's. Wonderful old photos, Jeanette, and you've used the sketch beautifully. 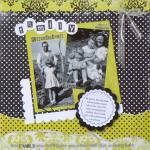 Oh Jeanette, your scrapbooking amazes me! I love how you've threaded the ribbon through the punched holes. The colours are spectacular and i love your sketch.